Heat oven to 375 F. Cook macaroni noodles according to package directions, until noodles are al dente. Meanwhile, heat butter in a saucepan over medium-high heat. Add flour and stir to combine; cook for one minute, letting bubbles form. Very, very slowly, add the milk, whisking constantly to incorporate it with the butter/flour mixture. This should take a couple of minutes. Add beer in just as slowly as you added the milk, stirring constantly. Add in Dijon, paprika, garlic powder, salt and pepper; stir to combine. Add in cheese and stir until melted. Combine macaroni noodles and cheese sauce; stir well to combine. Pour into a greased 9x13-inch baking dish. 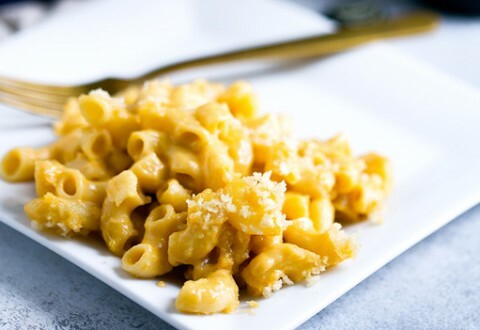 In a small bowl, mix together butter and Panko bread crumbs; sprinkle over macaroni and cheese. Bake at 375 F for 20-25 minutes, until macaroni is bubbling and breadcrumbs are slightly golden brown. Serve and enjoy!